Chris Ingham is a force of nature. He has contributed immensely to UK jazz in celebrating the music and legacies of countless jazz greats. These include Hoagy Carmichael, Horace Silver, Ella Fitzgerald and, with this most recent release, the songs of the legendary British actor and musician Dudley Moore. His Jazz at the Movies project, led by the core trio of Ingham, drummer George Double and singer, Joanna Eden, has been touring round the UK for several years, and with a variety of top players rounding out the quintet, has shown that anything's game for Ingham and his melodic menagerie. They marry somewhat disparate elements together through the musical magpie that jazz welcomes on a regular basis. 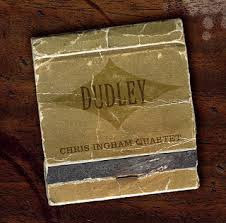 Dudley is no exception, and features his quartet with Paul Higgs, trumpet, Rev. Andrew Brown, bass, and George Double, drums. The young and talented saxophonist, Harry Greene, also guests on a few tracks. The disc contains a wide and refreshing selection of Moore compositions ranging from 1961 to the early 1970s. A few are associated with films like Bedazzled and 30 is a Dangerous Age, Cynthia as well as his iconic television show Not Only But Also (1965-1970) with Peter Cook. Particular musical highlights for me are Higgs' lyrical trumpet contributions - economical yet emotive throughout. He even contributes some "counterpoint soprano" backing vocals on Poova Nova. Tenor saxophonist, Harry Greene and Paul mix it up nicely in their four-bar exchanges on the CD's closer, Strictly For The Birds, which "is revealed as an immensely appealing and authentic slice of mainstream blues swing" according to the leader's tracklist note. The sturdy and melodic basswork of Andrew Brown scores throughout with his sensitive yet passionate and driving rhythmic feel. In his eloquent liner notes, Rev Brown writes: "Some of his pieces are, of course, quintessential expressions of the bright, optimistic, swinging '60s in which Dudley came to fame, but others are deeply poignant, personal expressions of a darker, more complex world, whilst elsewhere you'll find a unique and bittersweet mix of the two." In summary, the emotional range and depth that this fine ensemble has made playing Dudley's music has resulted in an intimate and heartfelt pleasure for both the artists and (hopefully) the listeners. It certainly was for me. LINK: See Chris Ingham's website to order the CD and for tour dates which continue nationally until September.